Most utility providers offer home energy audits at little or no cost to help customers identify particular areas where energy efficiency improvements can be made. In most Florida homes, the greatest return on energy efficiency investments comes from adding or improving attic insulation, installing low-cost weatherization measures, and upgrading the air conditioning system. Incentive programs often target these very types of improvements. Demand-Side Management: The use of incentive programs by a utility provider to increase the energy efficiency, reduce energy consumption and lower the operating costs of customers’ homes. Energy Audit: An inspection, survey, and analysis of an occupied building to prioritize its energy uses with an eye toward reducing energy consumption while maintaining or improving human comfort, health, and safety. Feedback typically emphasizes the most cost-effective opportunities for energy savings. Energy Efficiency Loan: Money lent to customers, usually at a reduced interest rate, for the purchase and installation of energy efficient/renewable energy equipment. Repayment schedules vary. Energy Efficiency Mortgage (EEM): A type of energy efficiency loan where the efficiency of a home is taken into account by mortgage brokers assessing an applicant’s loan eligibility. Giveaway: Free products or services given to consumers by utility providers or product manufacturers to encourage the use of a product or behavior. Heating, Ventilation, and Air Conditioning (HVAC): The sum total of components necessary to provide space conditioning for interior rooms in order to comfortably control the indoor climate in all seasons regardless of the outdoor weather. Incentive: Encouragement, often financial, for customers to make use of a particular product, type of product, or service. Load Management: Utility strategies to reduce consumer demand for electricity during peak usage times, which can reduce their costs of supplying power. Manufacturer Rebate: Money given by the manufacturer of a product to customers after they have made a purchase in order to lower the final cost to the customer and increase sales of a product. Tax Credit: Reduction of income taxes owed to encourage customer investments in a new product or service. Tax Deduction: Reduction of the amount of income subject to tax liability to encourage customer investments in a new product or service. Utility Rebate: Money given by the utility provider to customers after they have purchased and installed a new product or service. The intent is to encourage energy efficiency improvements by offsetting the final cost of the product or service. Weatherization: Home improvements that benefit the health and safety of the home’s occupants while reducing energy use and utility bills. Examples of basic weatherization practices include caulking and weatherstripping to seal air leaks along doors, windows, and penetrations through walls. Who offers incentives and why? Energy efficiency upgrades often require substantial financial investments. For homeowners, this may mean that even though investments in energy efficiency upgrades make sound financial sense in the long run, they may not be financially feasible in the short run. To help homeowners bridge the gap between energy efficiency and project affordability while addressing other concerns—such as power plant inefficiencies, increased power demand, and environmental and health issues—utility providers, states, and the federal government provide incentives for energy efficiency and conservation. Many types of incentives are available to you, the “end-user,” such as rebates, loan programs, and giveaways, and they are often coupled with manufacturer rebates to further reduce the financial burden of investments on customers. In Florida, the largest electric and gas utilities are required by law (through the Florida Energy Efficiency and Conservation Act, or FEECA) to meet energy savings goals set by the Florida Public Service Commission (PSC). Incentives are an important part of the demand-side management programs that utilities offer to achieve energy savings targets and reduce peak demands. Each year, the PSC publishes a report detailing utilities’ efficiency and conservation activities, types of incentives offered, programs’ cost effectiveness, and progress toward achieving savings targets. To learn more about energy efficiency programs and incentives offered by Florida’s utility providers, read the 2015 FEECA Annual Report and access past reports at the PSC’s online archives. What types of energy efficiency incentives are there? Energy efficiency incentives generally fall into one of six categories: structural, mechanical, appliances, lighting, alternative/renewable energy, and load management. Table 1 briefly outlines the typical incentives that apply to specific energy efficiency upgrades, but there is one other key incentive to consider first, and that’s the energy audit. The energy audit is not only one of the most common energy efficiency incentives offered, but it is also arguably the most valuable. Utility providers often have trained energy efficiency consultants on staff to help customers identify particular areas where energy efficiency improvements can be made. In recent years, utilities have also diversified their audit programs, offering customers a range of tools to assess their home’s efficiency and identify potential efficiency upgrades that are cost effective. For example, one Florida electric utility offers customers seven different residential audit options, ranging from free walk-through inspections to online, mail-in or phone-assisted audits to professional energy ratings. During an in-home audit, consultants will inspect many different features of the home that are often inefficient, yet which typical customers may inadvertently overlook as opportunities for saving energy. Before you make any major energy efficiency upgrades, consult a professionally trained energy efficiency expert. Generally, a home’s structural features are the first elements to consider when identifying areas for efficiency improvements. Common structural rebates include those for adding attic insulation and shading or replacing old or inefficient windows. Making these upgrades helps to lower the demand on a home’s heating, ventilation and air conditioning (HVAC) systems, which means that the same level of indoor comfort—heating and cooling services—can be achieved with smaller, more efficient, and more economical units. In addition, these types of renovations often qualify for loan programs that target residential energy efficiency. Some structural incentives, such as giveaways of weatherstripping and caulking, target leak reduction and improvements in overall home weatherization. These small changes reduce the exchange of air between the home and the outdoors, making your conditioned space less drafty and reducing your home’s heating and air conditioning needs. In most Florida homes, mechanical systems are the largest energy users, so they are often strong candidates for incentive programs. A home’s mechanical system primarily consists of the HVAC system components, the performance of which is affected largely by the quality and condition of a home’s windows and attic insulation. HVAC ductwork, which conveys conditioned air throughout the home, can be a major source of energy loss as any leaks will result in loss of cooled or heated air as well as infiltration of unconditioned air. For more information on HVAC systems in Florida, see the Air Conditioning fact sheet. Most utilities offer rebates for having HVAC systems and ductwork sealed and serviced by licensed professionals. For replacement of central air conditioning systems, many utility and manufacturer rebates may apply. In addition, certain energy efficiency loan programs apply specifically to HVAC unit upgrades. In most Florida homes, the second largest energy use is for heating water. Energy efficiency loan programs, along with utility and manufacturer rebates, have been offered for upgrading to energy efficient water heaters and other appliances. Generally, new appliances must meet a certain ENERGY STAR® level to qualify, so be sure to know the requirements of the incentive program you are pursuing, and the manufacturer information for the appliance you are considering. Finally, ask the salesperson or contractor with whom you are working to verify that you are purchasing a model that qualifies for the incentive. Upgrading incandescent lighting to more energy efficient, low wattage lighting, such as compact fluorescent lamps (CFLs), is a relatively low cost investment, making it ineligible for many incentive programs. Often, however, you can get CFLs through giveaways, at utility buy-down programs through local vendors, or at other local energy efficiency events. Light emitting diodes (LEDs) are another type of lighting that is part of a class of lighting called Solid State Lighting (SSL). Unlike incandescent or CFLs, LEDs are small electronic components that convert electricity into light. The cost of materials needed to make LED lighting has plummeted in the past several years. Although LEDs remain more expensive than their counterparts, their prices are steadily declining. It is especially important to value quality over pricing when purchasing CFLs or LEDs as this is critical to receiving the proper energy efficiency return on your financial investment. The Light Bulbs for Consumers website provides information on how to choose the best bulb for your application, a savings calculator, a listing of ENERGY STAR qualified bulbs, and more. By managing weather-sensitive peak demand, electric utilities can reduce their operating costs and delay or offset the need to expand generation capacity. In Florida, periods of peak residential electric demand typically occur during summer months and the warmest hours of the day—late afternoon/early evening—when people are home and running their air conditioners and fans to staycool. Colder parts of the state also experience winter peaks during times of high heating demand. To “shave” these demand spikes, utilities often provide incentives for customers to reduce their consumption during peak periods and/or shift their use from peak to off-peak periods. All five investor-owned electric utilities operating in Florida offer some form of residential and/or commercial load management programs with varying features and incentive structures. Load management programs rely on the flow of real-time information to provide signals during times of peak demand and tools that allow users to respond, reducing or shifting demand accordingly. If the customer makes the decisions about when and how to adjust use, the program is typically voluntary. When the program is structured so that the utility can override a customer’s system as needed, by overriding a programmable thermostat or turning off a pool pump, for example, this is a “direct load control” approach. An indirect load management strategy provides incentives for the use of stand-by generators or other forms of on-site generation (e.g, renewables) during peak periods. Incentives can take the form of a direct price signal (such as a time-of-use or tiered rate structure) or a monthly utility bill credit or rebate given to the customer based on their peak savings. What should I look for when considering energy efficiency incentive programs? When choosing energy efficiency upgrades to make in your home, it is important to consider carefully which ones will be most helpful in actually reducing your energy use, and therefore your utility bills as well. To get the greatest financial benefit when making upgrades, you must know which incentive programs are available to you, the products and services to which they apply, and the specific details of each program. For the most current information regarding federal, state, and utility provider energy efficiency incentives visit the Database of State Incentives for Renewables & Efficiency (Figure 1) and OpenEI Gateway: Incentives and Policies for Renewable Energy and Energy Efficiency. To get the most accurate and complete information about the incentives available now in your particular area, contact your utility provider and a trusted local vendor who supplies the product or service of interest. Isn’t it time your home started paying you back for a change? 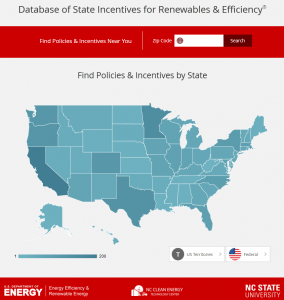 Database of State Incentives for Renewables & Efficiency. NC Solar Center. NC State University. Accessed June 9, 2015. Energy Efficient Homes: Air Conditioning. Institute of Food and Agricultural Sciences. University of Florida. EDIS #FCS3262. Accessed June 10, 2015. Federal Tax Credits for Consumer Energy Efficiency. ENERGY STAR. U.S. Environmental Protection Agency, U.S. Department of Energy. Accessed June 10, 2015. FEECA: Annual Report on Activities Pursuant to the Florida Energy Efficiency & Conservation Act. Florida Public Service Commission. Accessed June 10, 2015. Find A Solar Energy Expert. Florida Solar Energy Industries Association. Accessed June 9, 2015. Find A Solar Professional Now! Find Solar. Accessed June 10, 2015. Florida Renewable Energy Tax Incentives. Florida Department of Agriculture and Consumer Services. Accessed June 12, 2015. Incentives and Policies for Renewable Energy and Energy Efficiency. OpenEI Gateway. National Renewable Energy Laboratory, U.S. Department of Energy. Accessed June 10, 2015. Light Bulbs for Consumers. Energy Star. U.S. Environmental Protection Agency, U.S. Department of Energy. Accessed June 9, 2015. MFHE: Glossary of Terms. My Florida Home Energy. Florida Department of Agriculture and Consumer Services. Accessed June 9, 2015. Reports and Other Resources. Florida Public Service Commission. Accessed June 9, 2015. Solar Electricity Rebates and Incentives. Florida Solar Energy Center. University of Central Florida. Accessed June 10, 2015. Special Offers and Rebates from ENERGY STAR Partners. Energy Star. U.S. Environmental Protection Agency, U.S. Department of Energy. Accessed June 9, 2015. Weatherization Best Practices. My Florida Home Energy. Florida Department of Agriculture and Consumer Services. Accessed June 9, 2015. This document is FCS3268, one of an Energy Efficient Homes series of the Department of Family, Youth and Community Sciences, Florida Cooperative Extension Service, Institute of Food and Agricultural Sciences, University of Florida. This material was initially prepared in June 2008 with the support of the Department of Environmental Protection, Florida Energy Office, which is now the Florida Department of Agriculture and Consumer Services, Office of Energy. This revised version was prepared June 2012 and updated June 2015 with the support of the Florida Energy Systems Consortium. Any opinions, findings, conclusions, or recommendations expressed herein are those of the author(s) and do not necessarily reflect the views of the sponsoring organizations. Please visit the EDIS website. Nicholas W. Taylor, Research Associate; Jennison Kipp Searcy, Resource Economist; and Kathleen C. Ruppert, Extension Scientist; Program for Resource Efficient Communities; Florida Cooperative Extension Service, Institute of Food and Agricultural Sciences, University of Florida, Gainesville, FL 32611.